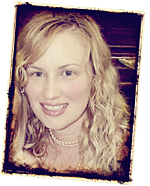 A blog by Joanne: Fairy Dust & Fangs! Today my Rose lost her first tooth. Unfortunately my little package from the Tooth Fairy didn't arrive in time, so I have to improvise. She was eating her tea and must have pushed it forward on some bread and it started bleeding heavily. I had my baby nephew here and he was crying because she was crying and 3 sisters were all in her face trying to see what was going on. I was very cool. Normally at the first sight of blood, I am gone, but I handled it well. I told her that if she gently grabbed it with the tissue, she could just lift it out. Between sobs she squeezed my hand and pulled it out. I was so proud of her. She was so brave pulling it out - Cate's first tooth hung by a bit of gum for weeks. She lost her first tooth today and her baby cousin got his first tooth yesterday - this excited her. She is still crying here. There was a lot of blood! Cate went and found a tissue and wrapped it like a "ghost" (they do this at school and draw eyes on the tissue like a ghost). 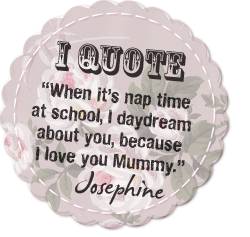 She then went and got the note the Tooth Fairy left her, sticky taped in her journal. 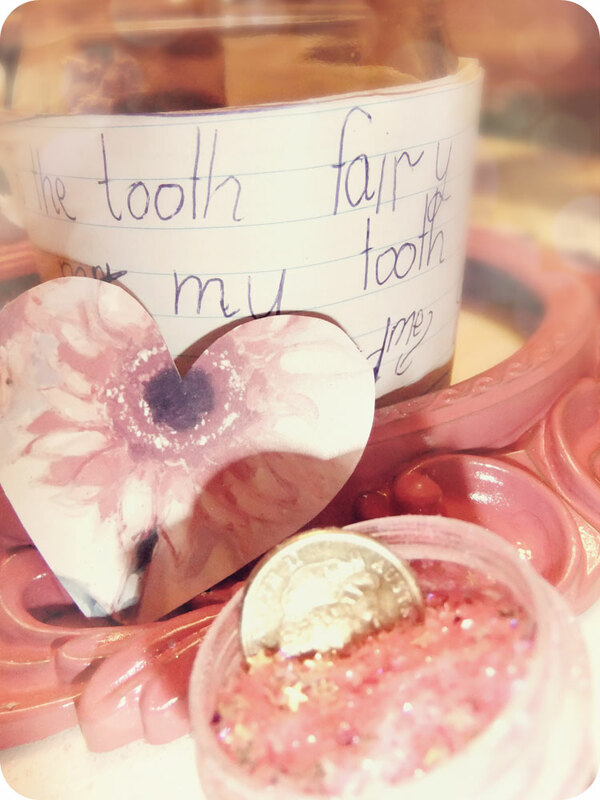 Next to it was the $2 coin and a little note she had written to ask the fairy if she could keep the tooth. All adorned in a beautiful drawing and the date. I'd forgotten that she had documented this. It is so cute. My eyesight must have been better then as I couldn't even read the letter it was so small - I don't know how I wrote it. I used this as the inspiration for Rose's letter. 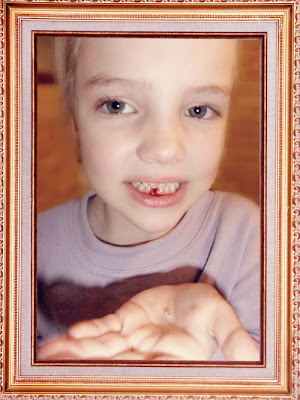 She had put her tooth in a jar with a note taped to it asking if she could keep her tooth too. I scoured the house for some unrecognisable paper and wrote her a note. 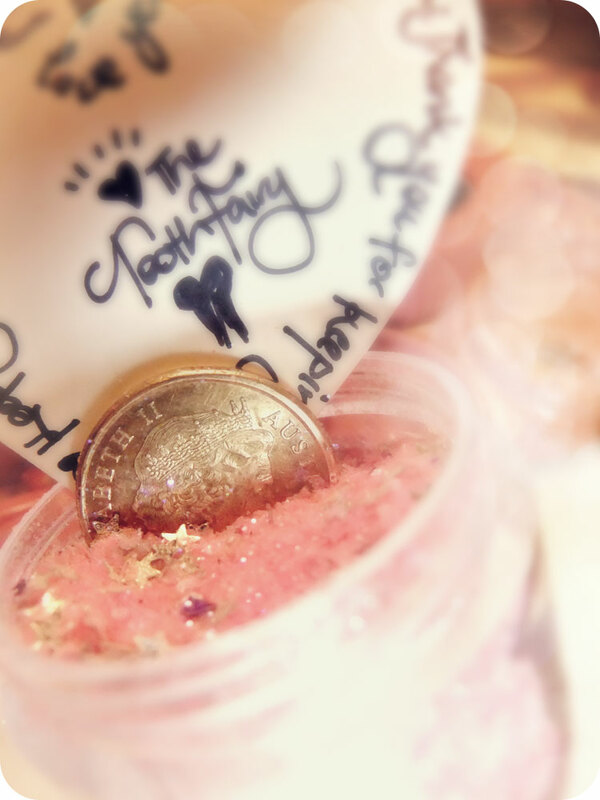 I found this little jar of glitter that has tiny, little stars in it. Perfect fairy dust. She is going to be chuffed. Here are some photos of the jar and the finished fairy letter. Congratulations my little toothless petal. Enjoy eating real foods again.